In default blogger templates we see Subscribe to : Posts (Atom) links below each post. Using this link our blog visitors can subscribe to our atom feeds. This is a great way to turn your visitors into readers but some bloggers find it creepy and this link does not suits their blog. Most of the bloggers want to remove these links from their blog to make their blog more classic and professional. By playing with blog template's HTML we can easily remove these links from all our blog posts in one go. Removing these links will not let your visitors to subscribe to your blog feeds but don't worry at all. Here at BBeginner.com, soon we are going to publish huge collection of subscribe widgets. Now lets start the tutorial on how we can easily remove Subscribe to : Posts (Atom) links from our blogger template. Log into your Blogger account, move on to "Template" option and click the "Edit HTML" button. Click anywhere inside the code area, then press the CTRL + F keys to open Blogger' search box. Remove the above line carefully and click on the "Save Template" button to save the changes. That's it! You have all done! 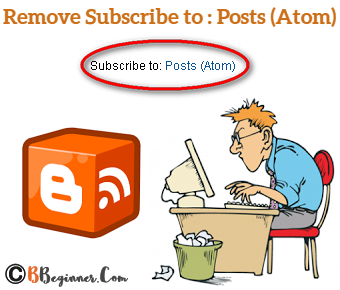 Now visit your blog and its new look without Subscribe to : Posts (Atom) links. How To Set "Custom Page Not Found" 404 Error Page In Blogger? Soon we are going to publish a huge collection of professional looking subscribe blogger widgets. So stay tuned and keep visiting BBeginner. If you have any query regarding the above tutorial, let me know through the comments box below.